Task / Concept: The idea came up from making the glass looks like stone blocks leaning against each other, thus creates an arc. The first prototype was built for a large barrel with dimensions of 6 * 8 m at the testing site of the faculty (Fig 01,Model) . 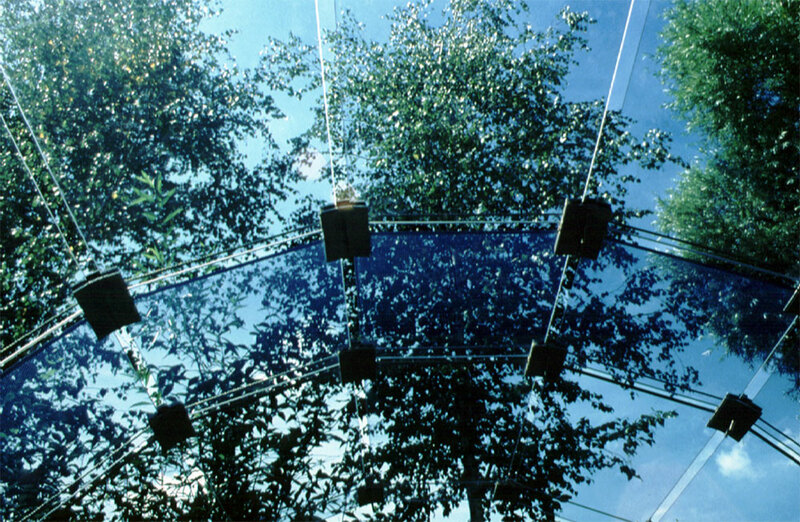 Supporting Structure: The system was approximately 2.50 * 3.00 m wide, it consists of glass panels forms a polygonal shape. towing cables were running parallel to the joints as the glass makes the system stiff, thus there was no need for crossing ropes. Preliminary tests had been carried out to check the stabilization of the system, which limits the deformation due to the loads to the acceptable levels (Fig 02,03,Isometric, overall system) . Construction: The detailing concerns the internal and external cable guides allows full control to the cables by raising or lowering the cable fixation for the individual nodes, also the construction was carried out on a falsework, which was removed after completion of the installation and tensioning of the system. The nodes consisted of edged 8 mm stainless steel plates and plastic spacers, its angle were determined by the radius of the system. 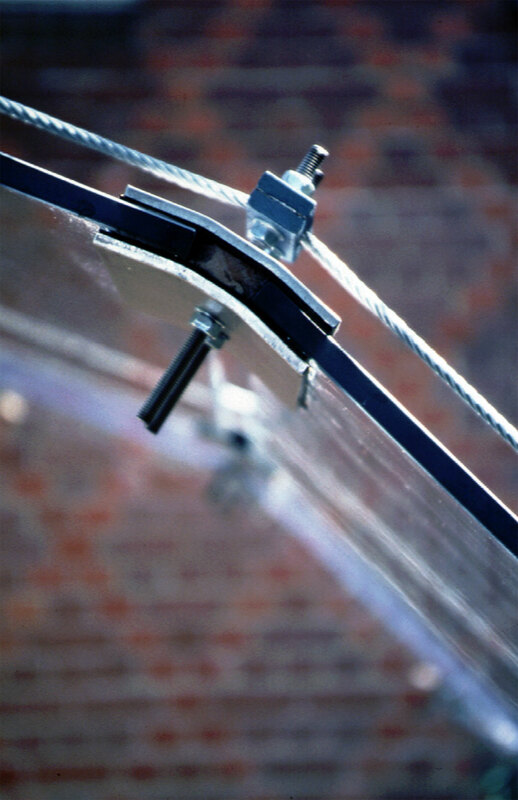 Spacers were specially developed and tested for this experiment (Fig 04,05,Bottom Detail, Node detail) . 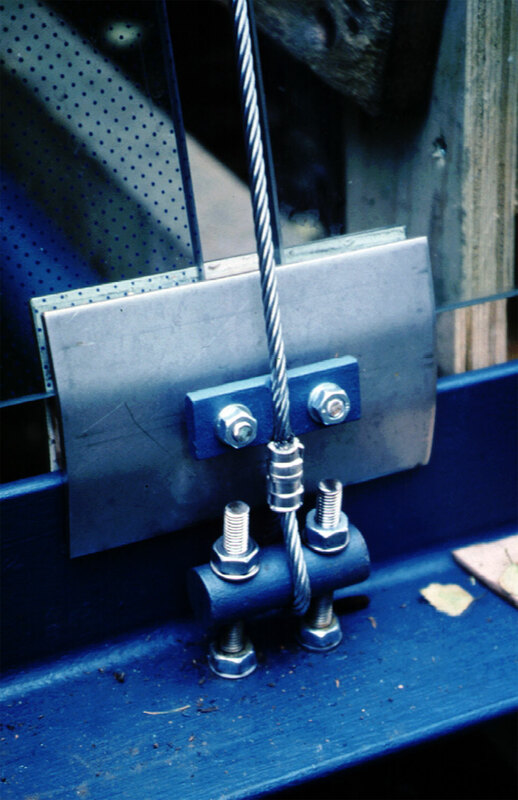 Glass: ESG panes had been used in this experiment, it could be easily replaced by VSG panes, also using insulating glass panes is possible (Fig. 06,07, Top view, looking up) .